Starburst offers gamers a chance to play in a high energy and fast paced atmosphere. The inclusion of an incredible range of features makes slot an exciting experience. Starburst has been in the market since 2012, a period over which it has significantly gained popularity. Its developers, Net Entertainment, have done an incredible job of improving it over time and now Starburst offers thoughtful and innovative play. 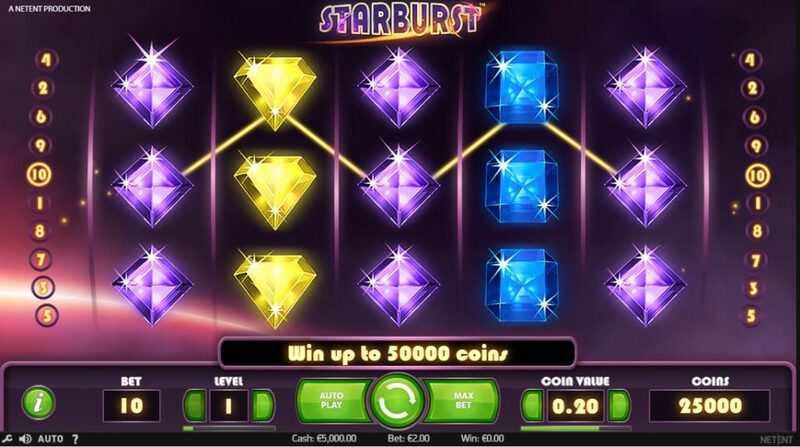 Starburst is an attractive game for all players offering an improved and exciting feature of ten paylines. The traditional wild symbols have been replaced with further expansions over the reels. The reels remain in their position for up to three re-spins without charging the player any extra amount. 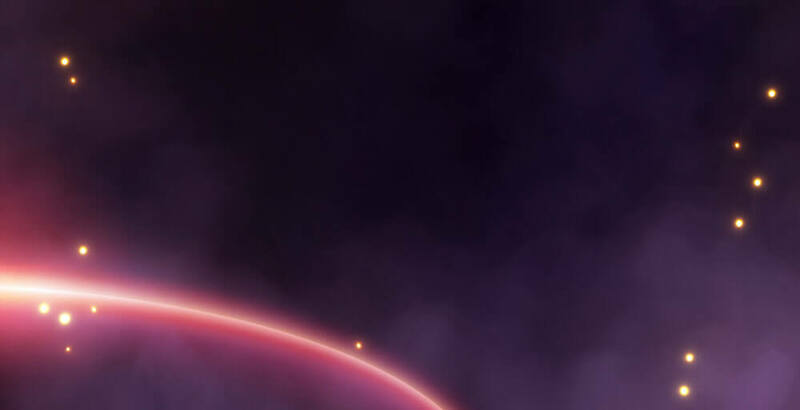 There are also Starburst Wilds that give astronomical chances of winning. Net Entertainment has added fun fair to the winning celebrations when you play Starburst. The screen lights up once you hit the right combinations and it makes the feeling of winning even more celebratory. 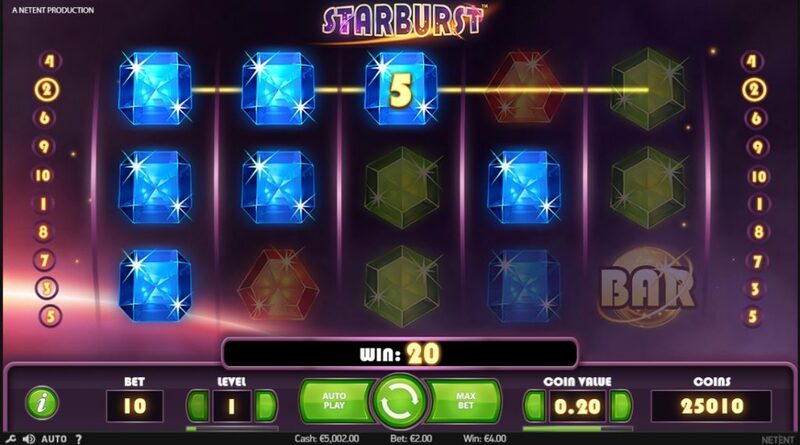 The betting options range from 0.01 to 100.00 which mean that Starburst is a perfect game for players of all levels. The chances of winning increase as your bets go up. With at least 10 betting lines, you are sure to win at an incredible pace. In fact, between the lowest and the highest bid, you have a range of winning slots to think about. 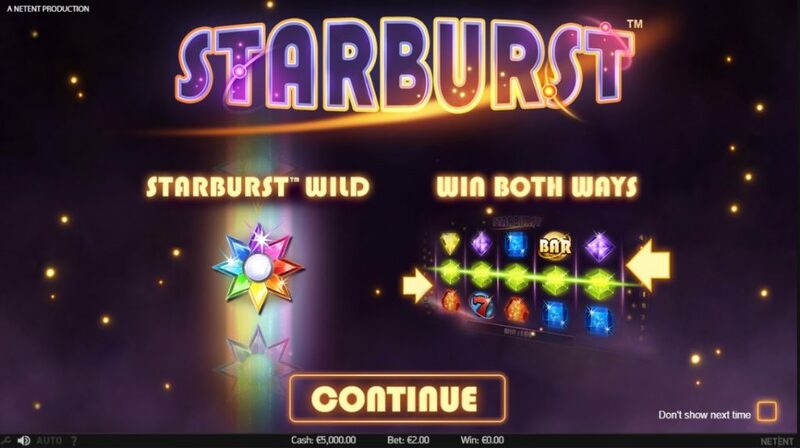 As there are ten win lines on Starburst and the win lines are organized to run from left to right as well as in the opposite direction, this means that your chances of winning are doubled. The slot game gives you a chance to place between one and ten coins on each line. It also gives to the player a chance to adjust the value of each coin. 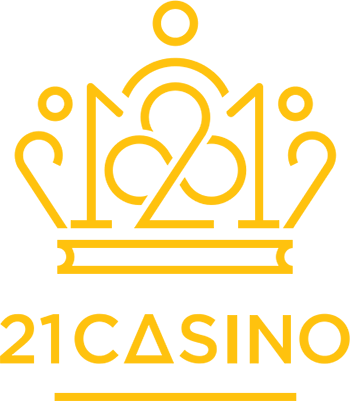 To determine the maximum you can win when gaming, you have to consider the value of the coin wagered, the bet level and the combination of win lines on which you are playing. The Wilds that have come to define Starburst expand over the whole reel. They can cover the entire reel despite only appearing on reels two, three and four. They cause the entire reel to spin repeatedly and the fact that they spin and re-spin increases your chances of winning. After three more spins and wins, the game returns to normal. The payout percentage (RTP) for Starburst video slots is 96.1 which can be described as low-medium variance. This is a theoretical number based on averages, given that each game is unique. Remember that game is built on ten winning lines, five separate reels and three rolls where Starburst Wilds and Starburst Lines win from all directions making the possibility of winning even more attractive and interesting. The winning combination must run from the left most to the right most of the reel. Where multiple wins are involved, they are added together. The pay table shows how the wins are arrived at and gives an overview of how these lines run.